Manual material handling (MMH) work contributes to a large percentage of the over half a million cases of musculoskeletal disorders reported annually in the United States. Musculoskeletal disorders often involve strains and sprains to the lower back, shoulders, and upper limbs. They can result in protracted pain, disability, medical treatment, and financial stress for those afflicted with them, and employers often find themselves paying the bill, either directly or through workers' compensation insurance. At the same time they must cope with the loss of the full capacity of their workers. To assist in reducing the issues with injuries and lost productivity, NIOSH (National Institute of Safety and Health) has created this extensive, free document for download. 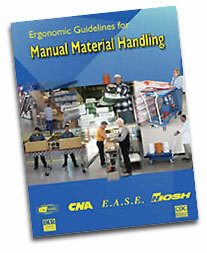 The booklet is written for managers and supervisors in industries that involve the manual handling of containers. It offers suggestions to improve the handling of rectangular, square, and cylindrical containers, sacks, and bags. You can download it from the NIOSH website. We have also included a copy here for your convenience.